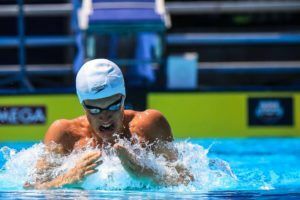 The 2017 competion year is gaining momentum while also the swimmers are working on their speed in training and at swim meets towards the World Championships in Budapest in July. 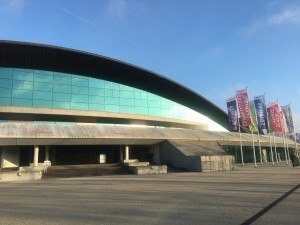 Again the Euro Meet can provide several Olympic, World and European Champions in the D’Coque Aquatic Center. Big stars like Katinka Hosszu, Sarah Sjöström, Adam Peaty, Laszlo Cseh and Marco Koch find their way to one of the first international events in 2017. 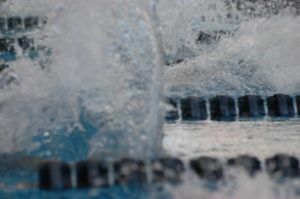 The first day kicks off with a mixture of direct finals in the 400m IM (women and men), the 800m freestyle (women) and 1500m freestyle (men) and heats in the 50m butterfly and backstroke and 200m butterfly. Katinka Hosszu, the 2016 Olympic Champion and World record holder in the 400m IM, finished first in 4:35,46 in this event ahead of two british swimmers: Aimee Willmott in 4:38,35 and Hannah Miley in 4:38,63. Last year, Laszlo Cseh (HUN) said at the press conference that he sometimes swims the 400m IM to remind himself why he hates it – he said it with a big grin. Great Britain’s Max Litchfield set a new meet record in 4:16,65, Gemany’s Philip Heintz finished second in 4:24,20, Laszlo Cseh came in third in 4:24,21. Hungarian Daniel Dudas now joins the Iron Aquatic Team – Katinka Hosszu’s swimming club in Budapest. Dudas led the field in the butterfly stroke in 58,09, finished fifth overall in 4:31,44. Martina van Berkel (SUI) set herself up as the #1 seed for finals with a time of 2:11,20 in the 200m butterfly, Hannah Miley (GBR) will be in the second seed tomorrow ahead of Katinka Hosszu (HUN). Top seed in the 200m butterfly is Duncan Scott in 2:00,43 ahead of World Champion Laszlo Cseh in 2:01,01. Scott was out in a 56.4 on the first 100 meters – a huge first half for this early in the season. Katinka Hosszu wins her second race of the evening, the 800m freestyle in 8:40,74 followed by Germany’s Celine Rieder in 8:42,81 – Rieder turns 16 last week and finished 10th in this event at the 2016 SC World Championships. Aimee Willmott was the third place finisher in 8:45,24. Fastest men tonight in the 1500m freestyle was Mykhailo Romanchuk (UKR) in 14:55,18 with a start-finish victory to set a NEW MEET RECORD. Romanchuk won a bronuze medal at the 2016 European Championships in both, the 1500m and 800m freestyle. Sergii Frolov (UKR) grabbed silver in 15:19,73 followed by Germany’s Poul Zellmann in 15:27,11. Olympic champion Sarah Sjöström (SWE) set the fastest time in the women’s 50m backstroke in 28,87, followed by Germany’s Nina Kost in 28,87 and Ukraine’s Daryna Zevina in 29,32. 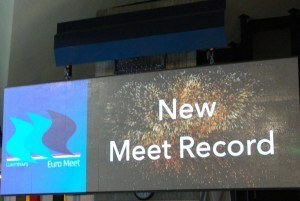 Apostolos Christou (GRE) equalizes the meet record, he touched in 25,16 in heat 3. He is the top seed for tomorrow’s final, second fastest into A final is Christ Walker-Hebborn (GBR) in 25,98 ahead of Gabor Balog (26,22). France’s Camille Lacourt was in the psych sheet-published some days ago- but finally his name wasn’t in the heat assignment. Top-seeded in the women’s 50m butterfly is Sarah Sjöström in a new meet record, she finished in 25,35, second fastest into the final is Italian’s Silvia di Pietro (26,56), followed by France’s Melanie Henique (26,84). Ben Proud (GBR) took the top spot for the men’s 50m butterfly final with a 23,63 ahead of Adam Barrett (GBR) in 23,82 and Damian Wierling (GER) in 23,90. 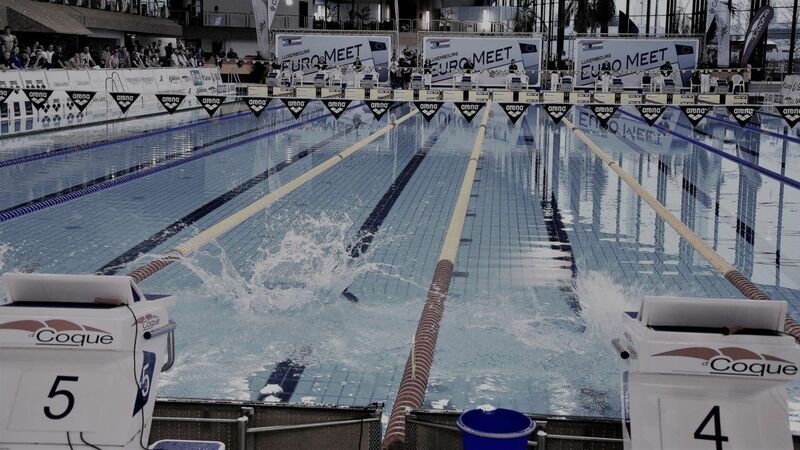 The Euro Meet takes place in the beautiful aquatic centre “d’Coque” at Luxembourg-Kirchberg. The facility has a 50 m, 10-lane competition pool and also a 50 m training pool as well as a 25 m warm-up pool. Luxembourg is a small country in western Europe, it is bordered by Belgium, Germany and France and it is one of the smallest sovereign states in Europe. Nonetheless the city of Luxembourg, which is the country’s capital, is the seat of several institutions and agencies of the European Nation and Luxembourg is the largest private banking centre in the eurozone. YASS Sjostrom is swimming the 100 back. Since she’s all but dropped the 200 free, I hope this becomes her fourth event. Is she so bad at breaststroke? Being good at backstroke and excellent with freestyle and extremely gifted at butterfly she looks like a great candidate for 200IM. 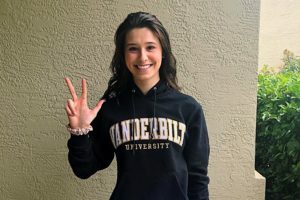 Unexpectedly for a sprinter she is also a swimmer with a great endurance being able to swim 400 free at 4:06 without ever focusing on this distance. But it looks like she hates 200 distance in any form to the very bottom of her soul. She’d sneak under 40s in an IM, but with Hosszu/SMOC going 36s both with 3 very strong other strokes, she’d be a long way behind. She could sneak under 2.10, similarly to Heemskerk, but unlikely a contender. 71mid SC 100br a few years ago. Call it 72/73 LC if we’re being kind. SMOC is going 66… Hosszu has a hugely underrated BR. I guess it’s rather about her agenda. A top athlete like she obviously aims for golds in Budapest. 100 fly is most likely hers and can collect at least another one in 50 fly or 50/100 free. On 200 events she has tough favorites to compete like Ledecky in free, Belmonte, Groves (and Hosszu) in fly, Hosszu and Seebohm in back, Hosszu and SMOC in IM. I see Duncan Scott with a 2.00.43 200fly ‘heat’, off a 56.49 100m split before noticeably easing off. Tasty in January. As I said a few weeks ago on here, this kid has a lot to give on free & IM as well as free. I’ve spoken to his coach a few times, I get the feeling he will race a lot more Fly in the short term to see where it leads. Certainly has potential in the events… 1’59.3 was a solid effort after the 200Fr with a committed front end- not bad for a 48.0 guy!? @RIEZ: Returning to our conversation other day about Hosszu: still cannot get what she is doing. If extra €300 are peanuts for her and cannot be considered a source of motivation then what was the reason to have such tough double this evening. By watching 800 race I can tell you that despite of very slow time (8:40) it wasn’t a walk-in-the-park. And looking at her after race I can confidently state that it was no fun for her. Is it the desire to keep going this “iron lady” brand pushes her to do such exhausting things. If it is so it can have some sad consequences when aging. It’s not to hard to understand, she is training while competing. So IT IS money. But in this case I will rephrase your statement: she is competing while training. It makes sense. Why to waste your energy for nothing if there is an opportunity to sell your sweat. Nono, my wasn’t a mistake. I think she uses this kind of meeting like hard training sessions. This is the only thing that makes sense for her intense schedule in minor meeting at the begining of the season. @EMANUELE: Ok, let’s stay with your definition because it doesn’t have greedy connection.